All Youth League Cup Finals are filmed from as near to the half-way line as possible, using just the one camera on a tripod from a reasonable vantage point in (or on top of) a main stand of a Non-League Club's stadium (which is where most Cup Finals are played). For Cup Finals and other matches which are played at more basic venues such as roped-off private pitches, we will try and use our own ladder-platform if we can, so that our cameraman can at least get some sort of vantage point and an unobstructed view of the action. Please note that we do not use aerial mast (Hi-Pod) filming equipment as that is more suited for wide-angle performance & tactical analysis filming where the action is too distant and close-ups are difficult to obtain. All Youth League Cup Finals are filmed by starting the recording from the players entering the pitch for the pre-match respect handshakes, then the Captains shaking hands with the Referee. We may film the odd cutaway shot of the crowd and other things happening in the stadium just before or after the teams enter the pitch, but in general we just film the whole match and nothing else (apart from post-match trophy presentations). If the filming of post-match interviews are required, the club who have booked us to film the match MUST provide the interviewer. We do not film pre-match coach journeys, warm-ups, team-talks or Half-Time entertainment, mainly because we need a rest and they are things that can be filmed easily by anybody. Our expertise is in filming the fast-moving action of a match, which is something that volunteers often find difficult. However, we do have professional commentary as an option on our Price List should teams wish to pay for it. We film all matches as a complete neutral and show no favouritism towards any one side...such as refusing to zoom in on a goalscorer because they are playing for a team who have not initially booked us to film the match. This therefore encourages teams to share the costs in order to obtain access to the footage after the match depending on the result. Please note that for the match to be filmed professionally by one of our cameramen, you MUST obtain permission in advance from the League/Cup Final organisers. Some Leagues and County Football Associations charge prohibitive ‘filming rights’ fees for their Cup Finals to be professionally filmed (which we then have to charge the club that has booked us), while other Leagues and County F.A.’s will not allow us to film at all because they may already have a deal with another video company to cover all their Cup Finals. 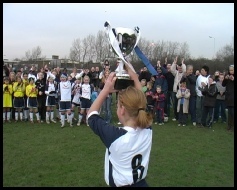 If you are booking us to film your Youth Team's Cup Final or any other match for players under the age of 18, you MUST obtain permission from the parents of all participating players from BOTH teams (in addition to that of the Competition/Cup Final organisers). This is a Football Association requirement. Some clubs, Leagues and County Football Associations have ready-made forms for this purpose whereby each participating player is listed and the parents sign the form next to their child's name which then gives their consent for the game to be filmed. In some cases that is now included on Youth team players’ League registration forms that they fill in at the start of each season. However, if that is not the case, we have our own Parental Permission Form which you can complete and hand to the cameraman on the day (before the match kicks-off). To download, print and fill in our own Parental Permission Form (in PDF format), please click here. If our cameraman does not have evidence of parental permission, he may be stopped from filming the match by the Competition organisers. At most of the Cup Finals we film for Youth teams, we find that the Team Manager is normally (and understandably) too busy to write out all the above details for us on the day, so we strongly advise clubs to appoint another club member as being responsible for providing this information for our cameraman. It is always best if a club can find somebody to write things down as the match goes on, especially for details such as the correct shirt numbers for players, substitutions made and the goalscoring order, as these can all be easily forgotten after a match and it is extremely difficult for us to guess which player is which if we do not have the correct shirt numbers available when we are editing the footage. This is also extremely important if you have chosen the option to have professional commentary added to your match.